First entry in the Sangreal Trilogy by UK fantasy writer Hemingway (The Poison Heart, 1990, etc.). In a prologue, young Nathan Ward enters the Darkwoods with his ageless mongrel Hoover and falls through a hole into an ancient chapel now buried under great roots. A small goblet gleaming with green gemstones in a green halo floats toward him: Christ’s cup of blood, full to the brim! But Hoover pulls Nathan back, the cup fades, and after Nathan climbs out he can no longer find the hole. The story proper starts a decade earlier as a homeless young woman struggles along a country road with a suitcase and a baby. She becomes the very long-time guest of bachelor Bartlemy Goodman, who turns out to be a 1500-year-old albino. He senses destiny at work in forlorn Annie Ward and baby Nathan. Bartlemy opens a small secondhand bookshop for Annie to run. Meanwhile, he intuits that humanly fatherless Nathan was actually incepted beyond the Gate of Death and has a great deed ahead of him. Hmm, what could that be? Annie senses a nameless threat hanging over her. Can it turn on the fabled Thorn family, who built this village centuries ago before their fortunes faded? 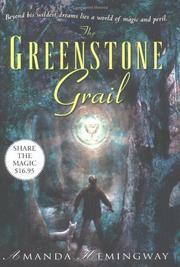 Were they in truth a satanic cult, and does the greenstone cup not hold the blood of Christ? Would Christ’s homely Grail be encrusted with emeralds? Bartlemy? He’s a culinary genius who discovered chocolate, worked for the Borgias and even taught Escoffier. The Cup? Stolen by the Nazis, it is now on auction at Sotheby’s. Can the Thorns get it back?